My little one doesn't like it when I work late. She calls me at the office and complains. "I miss you mommy," she says, in a voice that sends me running to the Swedish bakery down the street to assuage my guilt. When she calls again I have good news. "Cupcakes," I tell her. 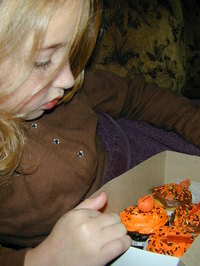 "With orange and black icing and little Halloween charms on top." When I get home, she is already in bed. Not quite asleep. But close. "Cupcakes?" she asks. "Not now," I say. "Tomorrow." She is too sleepy to argue. This morning I go to wake her up for school. It is never easy. Eventually she opens her eyes and focuses. Then, as if the past ten hours had elapsed in a blink, she smiles and picks up the conversation right where we left off. "Why, of course I will read!" the mother said gaily to her nine-year-old daughter. "What fun this will be!" she said eagerly. The two settled in for a cozy evening with a small, faded yellow book, plucked from the shelves with nostalgia and enthusiasm. "This was one of my favorites when I was about your age," the mother exclaimed excitedly as she opened the cover to begin the story of the convertible-driving girl detective with an unmatched skill for sleuthing. "You will certainly enjoy it," the mother remarked earnestly, gazing intently at her daughter, who was comfortably arranged under the bedcovers awaiting the story. "Oh Mother!" the girl said eagerly. "Let's begin!" But before they had reached the end of the first chapter, an unpleasant realization had begun to settle over the mother. "Oh dear," she thought to herself, turning the pages more and more reluctantly. Had she misjudged her childhood powers of literary discernment? 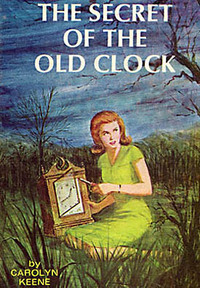 For even as the feisty blonde sleuth from River Heights qualified for the golf tournament, reeled in a handsome, red-headed tennis champion for her dinner date and fearlessly solved the Secret Mystery of the Hidden, Haunted Staircase Bridge at Lilac Ranch Farm, the truth was becoming more and more clear. She was trapped! Having fondly recalled for her daughter her affection for the exploits of the brilliant only child of the brillliant criminal defense lawyer Carson Drew - Nancy, who was both smart and attractive, modest and popular, brilliant and kind, fearless and clever and who never, ever had a bad hair day - now she would be forced to read them all! Out loud! With each creaky adverb flinging itself urgently, wickedly and indifferently into every exhortation! I don't like to complain. Recent studies, documented in the July report of Psychosomatic Medicine, suggest that women who don't fully vent their feelings when arguing with their husbands are "four times as likely" to die of heart disease as women who "always" tell their husbands how they feel. 1. 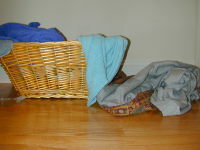 Home-improvement prowess doesn't exempt you from having to put your dirty clothes into the laundry basket. 2. If you are so much smarter than a raccoon, how come you are the only one in the family who hasn't had to pick garbage off the lawn at 6 a.m.? Wait... don't answer that. 3. Your observation that Dennis Kucinich's wife is a hot young redhead with a tongue piercing is not exactly astute political analysis. Observing it repeatedly is not exactly astute marital commentary either. There. I think I will skip the StairMaster today.